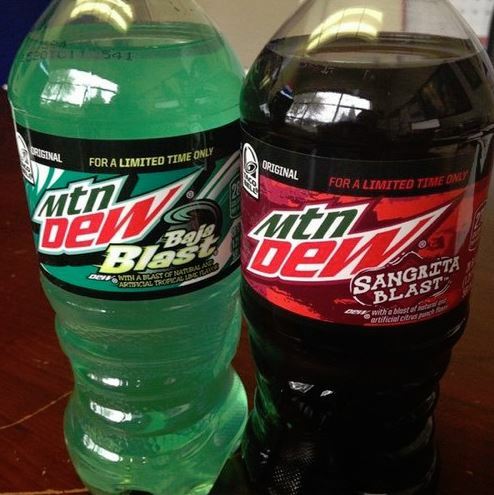 Mtn Dew Baja Blast is back, and Mtn Dew Sangrita Blast is here - 2 flavors that are Taco Bell Originals! Only available for a limited time, today April 20th they are released (Shhhh... Don't tell PepsiCo that I picked these up yesterday on the 19th). The 2015 12oz Baja Blast can is VERY similar to 2014 Baja Blast can, with the biggest different is the new 2015 can, the "For a limited time only" around the top is all in 1 color, the older 2014 can has a couple different colors. The 2015 24oz Baja Blast can is a lot more different, as the 2014 24oz Baja Blast can had a contest & contest rules on the can, this years does not have it. I've only found the 12oz Sangrita Blast can so far. I do not know if there is a 24oz version of it, but since they have done it with Baja Blast, I would guess maybe we will see a 24oz Sangrita Blast can also. DPSU (Dr. Pepper/7up) is currently testing 3 "Naturally Sweetened" versions of their drinks, currently being testing in Texas, Iowa, and the Chicago area. There are 12oz Slim cans, naturally sweetend with Stevia Leaf Extract & Real Sugar. They have Dr. Pepper, 7up, and Canada Dry. I've been lucky enough to find some, and I've tried them. [NOTE: I normally don't like Diet cola's, so my opinion about these probable don't mean much]. Both me & my wife did not like the Dr. Pepper. I don't drink Ginger Ale, but my wife can tolorate the Canada Dry and will drink them. I can tolorate the 7up, and will drink those also. I collect cans, and I HATE wasting soda - so I always try to bottom open the can, pour the drink into a cup, and drink the soda. We will end up dumping the Dr. Pepper, but at least we will drink the others as I save the cans. NOTE: I got 12 cans of each, and I'm not ready to trade yet as I'm still waiting for my new place to be built, but hopefully in the next couple of months it will get built, and I'll be ready to trade - so if they are not available in your area and you REALLY want some of these cans, I should have some to trade!. Below are a few others that I have recently found. Some Dewshine bottles (An OK drink, but nothing I will regularly buy at a premium price), some Coca-Cola (Product) Red bottles, and some real sugar Dr. Pepper Cans. NEWS: 2015 Coca-Cola "SHARE A COKE" Promotion will be back. This year, for the 20oz bottles (which I don't care too much about), they are going to have close to 1,000 different names on them this year! (x4 more then last year). For cans, they will be back also, but I'm not sure how many different names they will have in the USA. This is a VERY POPULAR promotion around the world, starting in Australia in 2011-2012, and now is in more than 80 countries around the world! http://www.shareacoke.com - You can get more information here, and ALSO - you can order customized 8oz glass bottles. Most regular names are in the database, anything else you will have to request to be added. LOOK AT THIS PICTURE - POPCAN ORG is now in the database! (They won't let you put a . in the name, but close enough.) I thought about seeing if it would allow me to add "Pepsi" as a person to share a Coke with, but did not want to push my luck, they already approved 5 of what I wanted. FACEBOOK: If you are on Facebook, go and LIKE my Page: https://www.facebook.com/popcan.org - Facebook is a lot easier to update then this website, so I often post new things there a little quicker then they show up here. News #1: As I write this, countdown to 2015 Baja Blast Mountain Dew returning is 22 days, 6 hours, 0 minutes, 49 seconds, and 730ms - which is April 20, 2015. I believe Sangrita Blast will be released at the same time. So no picture of the cans yet, but both will be available in cans. Since the last Baja Blast cans had a promotion on it, this years cans should be at least a little different. 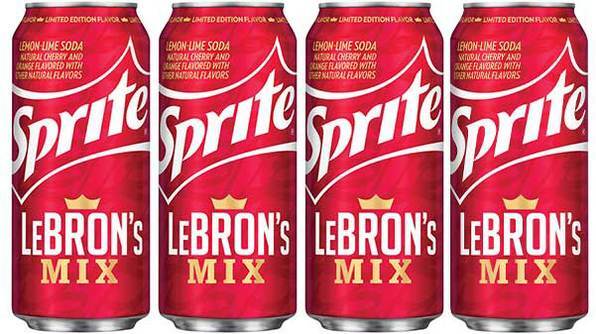 News #2: Sprite LeBRON's Mix is back - This time the 16oz cans are red, but same flavor. I found some at a gast station yesterday, so look around - they should be showing up more places soon. UPDATE ON GARAGE - Still waiting. Down payment was made in October 2014, and since then either rain, snow, or very very soggy ground has made it so nothing could be started. But soon hopefully. As soon as we ever get more then a couple of dry days in a row hopefully. In stores LATE MARCH 2015 - DewShine - "A dangerously delicious clear-citrus Dew, inspired by Dew's homebrewed mountain roots, now available legally for the first time! made with Real Sugar." OK, currently not going to be available in cans - just 12oz glass bottles (singles & 4 packs). I LOVE most Dew products, so can't wait to try this! USA Coca-Cola NCAA Final Four Basketball can. Found today at the store, would guess there will be a similar looking Coca-Cola Zero can also, just not at my store yet. Other updates: I've been busy, getting 2 things from my "Most Wanted Cans" and have a 3rd item on the way to me. So I've also sat down and updated my "Most Wanted Cans" - Looking for Pepsi AM, Diet Pepsi AM, Mountain Dew Sport, Diet Mountain Dew Sport, Mountain Dew Red, special "Win" cans, prototype cans, limited edition cans, Xbox Mountain Dew Can, Halo Mountain Dew Can, and I'm sure there are others I REALLY WANT but maybe I just don't know about it yet. Also, if you are on Facebook - Check out my Facebook Page - sometimes it is easier to update that page then this website. Well after getting plans for my new hobby/can garage, putting the down payment down, it had basicly rained all the time and then now we are sitting with snow all around... and for some reason they don't think it is wise to pour the floor on top of mud or something. So I'm still waiting to pull my cans out of storage, so I can start to sort - figure out what I have to trade, and to start trading. I've waiting 15 years... a few more months I guess I can wait. 2 new Mtn Dew Kickstart's, 12oz slim can - Kiwi Strawberry & Pineapple/Orange/Mango flavors. Welcome to POPCAN.ORG, a website dedicated my can collection. YES!!!!!!!! After almost 15 years, my pop can collection will have a home - out of the boxes, and will be out for display. Not only that, will be able to start to trade again, and get a lot more active in growing my collection. As of early November 2014, we are now waiting on weather & scheduling to get the garage started & built. So while I wait, I've totally updated my website. All the links on the left work now - Even got a new video up in the "How to Drain Cans" link where I should how I bottom open my cans in about 30 seconds each. Nothing in my Trade List area yet, but hopefully soon.